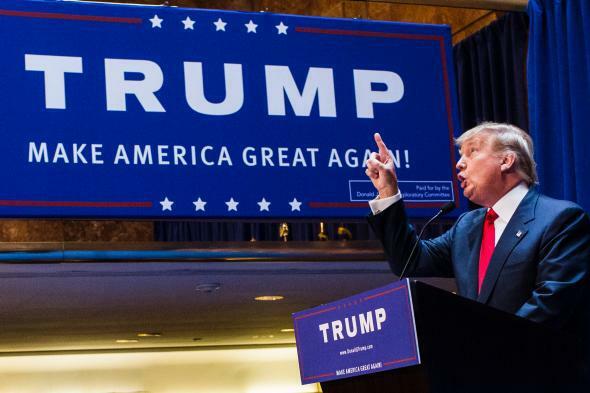 Trump says yes GOP pledge: Donald Trump signs RNC loyalty pledge, ends third-party threat. Donald Trump did something Thursday that he’s refused to do since he jumped into the Republican race: He vowed to back the party’s eventual nominee in the general election even if it’s not him. “I will be totally pledging my allegiance to the Republican Party and the conservative principals for which it stands,” Trump said at a press conference at his Manhattan headquarters after meeting with Reince Priebus, the head of the Republican National Committee. I, ______, affirm that if I do not win the 2016 Republican nomination for president of the United States, I will endorse the 2016 Republican presidential nominee regardless of who it is. I further pledge that I will not seek to run as an independent or write-in candidate nor will I seek or accept the nomination for president of any other party. The pledge was specifically aimed at Trump, who before Thursday had refused to rule out a third-party run since he said threatening one gave him so much “leverage” in the race. Shortly after, though, Trump made it clear that his calls for “fairness” shouldn’t be mistaken for a suggestion that the race will be fight-free. During the roughly 30-minute press conference, he managed to throw punches at half a dozen of his GOP rivals, including Rand Paul, Rick Perry, Lindsey Graham, and his favorite target, Jeb Bush. Given the outsider image Trump has taken great pains to craft, the decision to sign the RNC-authored pledge is somewhat surprising. Still, it does come with a few traditional political benefits: It removes the possibility that some state GOP officials would try to keep him off their primary ballots, as several had suggested. It also will stop Trump from facing the same type of grilling at the upcoming CNN debate about a possible third-party run that he received from Fox News at the last one. Perhaps more important to Trump, though, is that the pledge works both ways: In the event he somehow proves everyone wrong and ends up winning the GOP nomination, the other 16 candidates would have to back him. The prospect of Jeb stumping for The Donald in 2016, then, may be the only thing worth more to the billionaire dealmaker than the leverage his third-party threat gave him.